In the wake of a strong 6.0 aftershock early this morning, the administrators, teachers, and staff of Quisqueya Christian School are determined to be involved over the long term in the relief and recovery efforts in Port-au-Prince. Reports indicate that the campus was again undamaged this morning though other buildings in the neighborhood still standing after the quake a week ago have now collapsed. To give to ongoing relief efforts at Quisqueya, click here and donate through PayPal. Teachers who have remained in Haiti this past week, some of them European or North American, have found ways of being involved. 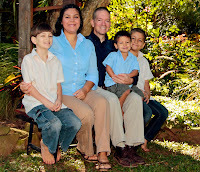 Ben and Katie Kilpatrick just arrived in Haiti at the end of December. Less than a month into their stay, they find themselves carrying makeshift stretchers, cleaning wounds, and comforting injured children at a temporary clinic established on the grounds of their church. High school principal Tony Dekoter ended up on guard duty on campus one night. The Canadian missionary from the Christian Reformed Church plans to remain in Haiti as long as he's needed to help in any way he can. Sean Blesh, in Haiti with his family since August 2007, who found himself on the rescue team last Tuesday night pulling people from the collapsed Caribbean Market, has been working with other teachers to prepare the campus to be occupied by the U.S. Army Southern Command. The campus now houses U.S. Army personnel including a high-ranking general, reports Crisis Response International. Director Steve Hersey writes that he had the opportunity yesterday to brief Army Special Forces troops that will base at the school. Teachers were asked to clean out their classrooms so that the soldiers could move in. Senior Jessica Ackerman helped her mother, a teacher at the school with the task. The German orthopedic team camping on the grounds continues to offer its services at nearby Hôpital Espoir. [UPDATE, 11:35 am. A message has come from Els Vervloet that the team has had to be withdrawn from Hôpital Espoir due to damage sustained to the operating room this morning in the 6.0 magnitude aftershock. The orthopedic team will be redeployed to Diquini/Carrefour to the west of Port-au-Prince, nearer the earthquake's epicenter.] Displaced orphans have occupied a classroom wing and the six-member CRI team from Kansas City has been camping on the soccer field. The relief operation based at the QCS property continues to grow as administrators reach out to Quisqueya's community of students, parents, and alumni to participate. School registrar Els Vervloet of the Netherlands today requested volunteers to serve as telephone operators. She asked for people with skills in English, French and/or Haitian Creole, and Spanish if possible, to respond. These operators will be working around the clock in three shifts manning the high-tech Emergency Operations Center installed on campus. This equipment, loaned and put in place by Quisqueya graduates Joel Trimble, Jr. and his brother, Michael, does not rely on existing telephony infrastructure but used satellite technology. The Trimbles are communications engineers and the specialized electronics come from IT Broadcasting. The brothers chartered a flight from their Florida base to Cap Haïtien on the north side of the island and transported it overland to Port-au-Prince. This morning school director Steve Hersey sent out a request over Facebook for motorcycles and skilled drivers to be used in the relief effort. Facebook has been an important channel of communication for many in Port-au-Prince during this crisis as well as a means for those outside of Haiti to find loved ones and follow the relief efforts. Hersey and school Chief of Operations Ted Steinhauer as well as other administrators have been working hard to coordinate with military and other relief organizations that are operating in their area, but they've also been meeting with school personnel to discuss how the relief operation will develop into a recovery and rebuilding operation. They intend to partner for the long term with their community to serve those who have been affected by the quake. This investment in the community is not something QCS began after the earthquake. The school has a long tradition, sustained by compassionate teachers and energetic students, of investing in its community. Els Vervloet reminded alumni, parents, and students two days ago of the H.O.P.E. orphanage, this year's senior class's Community Service Project focus. The orphanage sustained damage in the earthquake and now "the H.O.P.E. girls and the family running it are living in 2 small rooms next to their clinic." Many of those seniors, heartbroken, have now had to leave Haiti, unsure of if or when they'll ever return. A difficult decision has been made this week by QCS teachers, administrators and parents to send some family members out of the country. Torn between the desire to serve the desperately suffering and the need to see their families well, in some cases children have been sent to live with relatives or mothers of younger children have taken their children to the US, Canada, or Europe. Those not vital to the relief effort often felt they were using resources--food, water, cooking gas, power--that would be better used by someone else. Some expressed a sense that they were abandoning Haiti, their Ayiti cheri (Dear Haiti) that they love and mourn for. There are feelings of guilt and anguish for those who did not survive. Many will return as they have many times before, but for now they feel they ought to do more. There will be much, much more to be done. International leaders swear they will rebuild Haiti but as always it will be individuals and families, serving in small ways, that will make the difference for the people of Ayiti cheri. Andy- thanks for keeping us posted! It really helps in knowing how to pray!